Bertin Technologies has started marketing the Sterilwave system – an innovative solution for treating medical waste. The company’s innovative development offers conversion of biohazardous waste to regular municipal waste by means of the waste grinding and sterilization by microwaves in a single container. The solution is environmentally friendly, does not produce wastewater, is easy to maintain, and its operating costs are lower compared with those of the burning in a furnace, of the existing autoclaving type methods (steam under high pressure) or of the evacuation to the Ramat Hovav site. The waste management process by means of the suggested innovative solution comprises four main stages: initially, biological waste is manually or automatically loaded to the container; at the second stage the waste is ground in order to reduce its volume; at the third phase the waste is heated for the purpose of sterilization using the microwave; and at the fourth and final stage, the ground and sterilized waste is transferred to a container intended for the removal of regular municipal waste. The process, which takes approximately 30 minutes, converts biohazardous waste to inert municipal waste that cannot be identified. 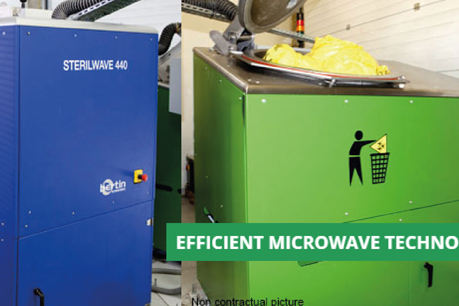 The use of microwave technology is recommended by the WHO as having the lowest operating costs among the biohazardous waste treatment solutions. The company offers a range of products suitable for small, medium and large health centers. For more details please contact Shlomi Shimonov, Strategic Procurement manager, at 09-8922072.